The Ministry of Culture and Tourism of Turkey will be sending Konya Turkish Tasawwuf Music Ensemble’s members to Australia to perform at Turkish – Japanese joint events. 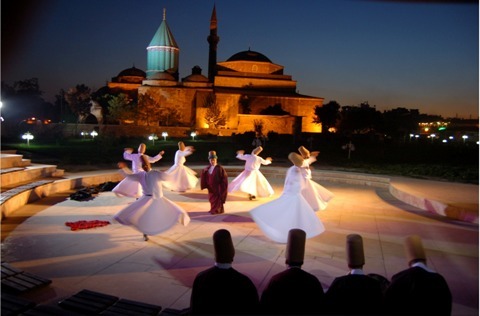 The Turkish Republic Ministry of Culture and Tourism’s Konya Turkish Tasawwuf Music Ensemble was established in 1990 with the intention of carrying on these old traditions and introducing people to Turkish Tasawwuf music and traditional Samâ Âyîns (Whirling Prayer Ceremonies) in their purest forms and performed at the highest level. The ensemble performs yearly during the Mevlâna Commemoration week (December 1st – 17th) and at the Shab-é `arûs ceremony (Hazrat Mawlānā Jalāl ad-Dīn Muhammad Rūmī’s passing from this world into the realms beyond), as well as in various special events located in other cities around the world in many different countries. This entry was posted on Tuesday, April 13th, 2010 at 9:31 am and is filed under Announcements. You can follow any responses to this entry through the RSS 2.0 feed. Both comments and pings are currently closed.